Two never- before seen poems by Sappho were discovered in a buried urn at the Burgeron Trailer grounds last year when Betsy de R. was investigating some strange occurrences. While classicists rejoiced at the discovery, the Bovine County residents were worried about the attention this would bring to their peaceful community. 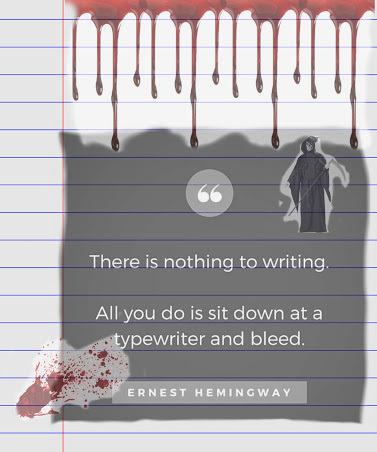 As it turns out, Cousin Ron Burgeron is a world renowned papyrologist at the University of the Netherlands and he has indicated that the poems’ origins are unknown and may have found their way into the black market and ultimately purchased by an anonymous collector in Amsterdam. 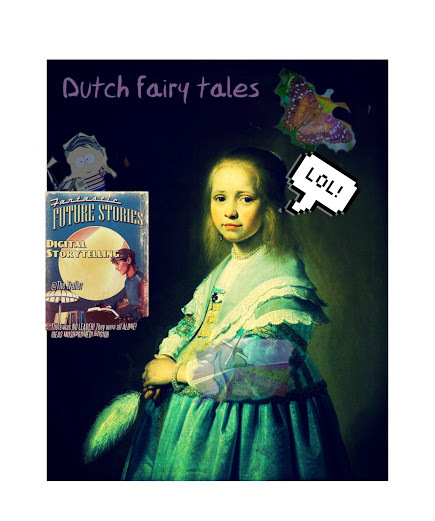 Professor Ryker Teunis of the University of Amsterdam, at the invitation of Cousin Ron, will be attending the Bovine County Fairy Tale Festival as a pre-eminent Dutch fairy tale scholar, and so will be able to illuminate the poems’ references to windmills and butterflies. 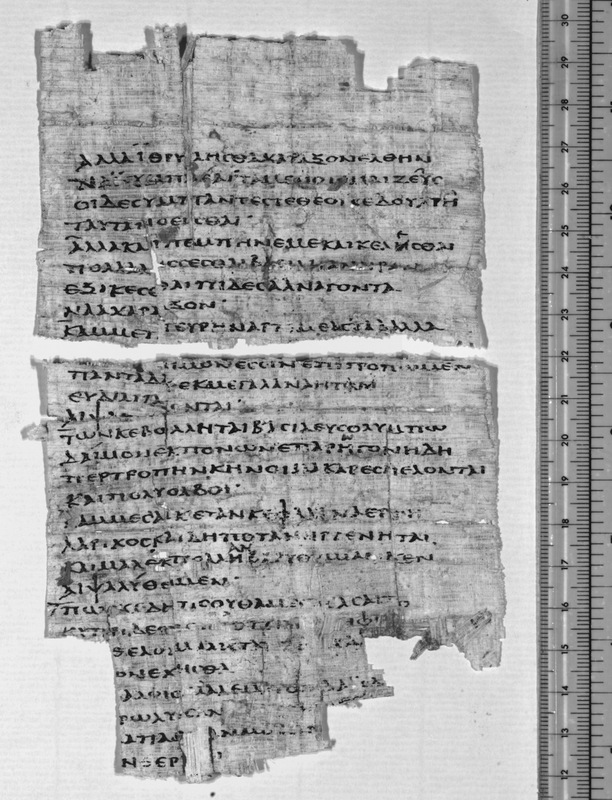 Bovine County’s daily newspaper has already announced the summer Fairy Tale Festival, but it has made no mention of the recent Sappho poem discoveries in an attempt to discourage a summer population boom especially from those in the Society for Classical Studies (SCS). 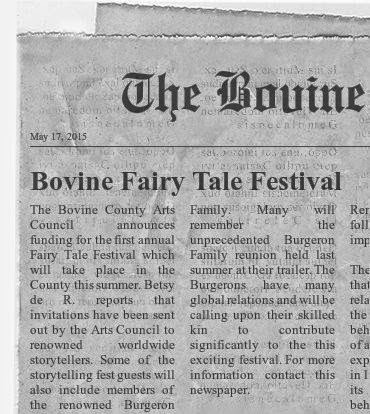 Aunt Sappy would like to invite the entire extended Burgeron family to the Bovine Fairy Tale Festival to get a flavor of ‘Southern Dutch’. Good times ahead! It’s been a while since we found Nana Lou surfing with Sappho on Maui.The leaves are falling now from the few trees around the Burgeron Trailer, and the Burgerons are nowhere to be found, leaving the trailer abandoned to the elements. 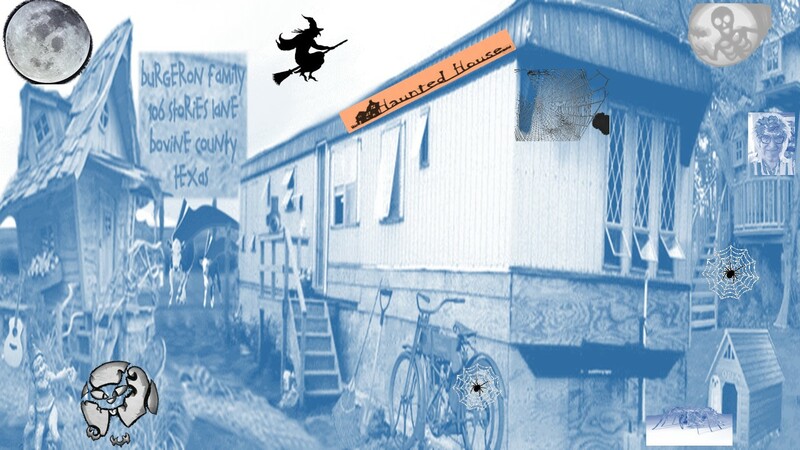 Spiders make homes now where pets were housed and the full harvest moon languishes in the sky casting ghostly shadows on the once lively trailer in Bovine County. Nana Lou’s spirit still haunts the trailer grounds, and her ghost appears from the balcony of Dr. M’s tree-house on moonlit nights. 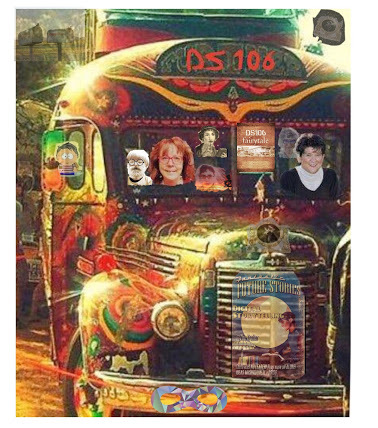 Strange howls and cat screams punctuate the still nights while the ‘East of the Web’ Witch has been seen riding her broom above the trailer. For the Eagles, the story was meeting a girl in a flat bed Ford– what else might have happened on this corner? Betsy de R. and Sappho (Aunt Sappy) have revealed some secrets and have co-produced a short film for the Burgeron family. They are using this short film as a trailer for a full feature length film they plan on producing in the near future. Betsy de R. and Aunt Sappy have struck pay dirt! 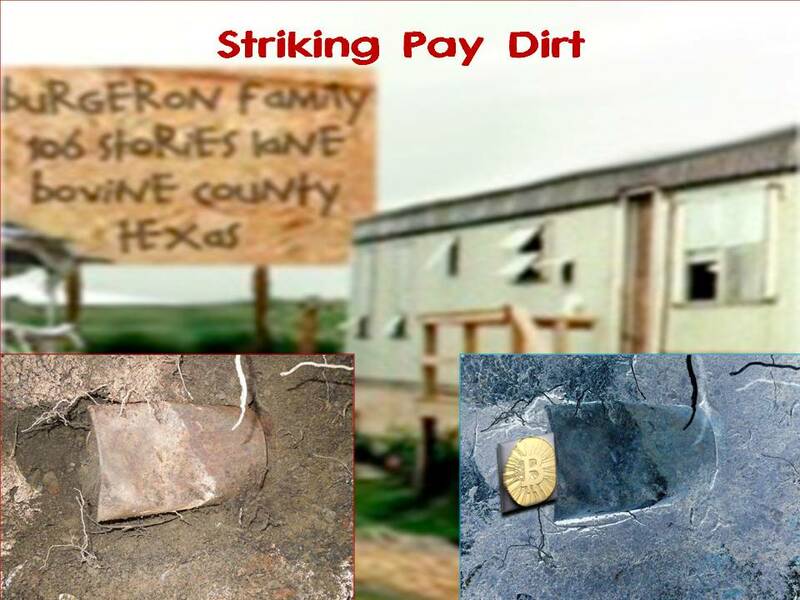 They are not telling their story quite yet, but they wanted to show the Burgeron family some of their findings in that old tin can they found while digging late at night 2 weeks ago. On their way to the internet cafe to post their news, they passed a sign in Bovine which brought back many memories. 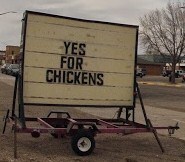 What with all of Don’s cows running around lately, they thought it was time to remember some of the chickens at the trailer! 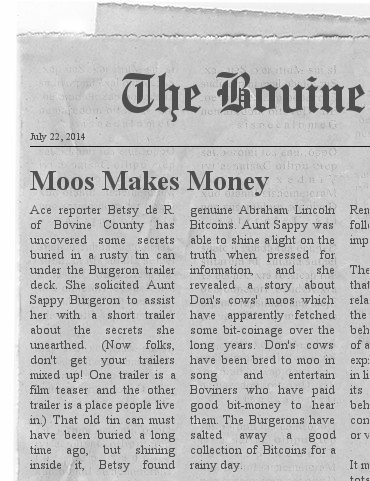 Betsy de R. is sure that the Bovine Herald will pick up on the Bitcoin discovery unearthed 2 weeks ago under the trailer deck. Sappho has been taking some time out from her Burgeron preparations to enjoy the warm summer and all the street festivals in neighboring Bovine County towns. Although she has never known why Ma and Pa Burgeron gave her a Greek name, she has always been fascinated by antiquity and especially some of the folkdancing still preserved in the many multicultural communities across North America. The links to the ‘old country’ are palpable in dance and food. Here is a video of Greek Day which Sappho filmed while traveling last year. Sappho and Betsy de R. have also been digging around the Burgeron trailer off and on looking to unearth some of the Burgeron secrets and mysteries through artifact collection. 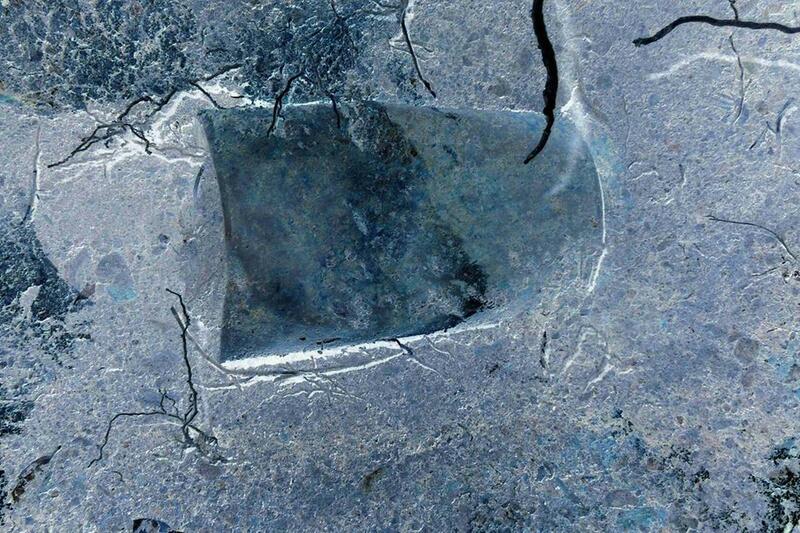 Last week, they found an old tin can under one of the trees near the trailer deck. Betsy de R., ace reporter, was able to capture an image even with very little light. When Sappho saw the old tin can, she was reminded of a story Pa Burgeron always used to tell her when she was young about when he was stationed in Gozo.